A stunning lab diamond cuff bracelet featuring two round diamonds, one on each end surrounded by halos. Made to fit your wrist. Available options: platinum, 14k or 18k gold: white, yellow, rose. 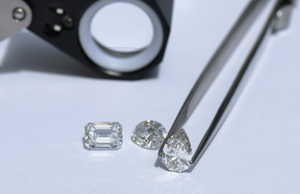 All of the diamonds used in Ada's custom jewelry are hand-selected for quality, fire, and brilliance. Always custom, sustainable and conflict-free . Ada Diamonds Design Description- This sophisticated cuff bracelet features two round brilliant lab grown diamonds at each end surrounded by beautiful halos in 14k white, yellow, or rose gold settings.